From the very beginning this was an easy and enjoyable book to read despite me singing Space Oddity constantly in my head (and sometimes aloud much to the dog’s confusion). We follow the tales of Thomas Major, a scientist who accidentally becomes a spaceman and ends up on Mars. But we also meet the Omerods – Gladys, Ellie and James. Ellie and James are the grandchildren of Gladys, they are living with their grandmother whilst their father is in jail. 15 year old Ellie is stretching herself to the limit to make ends meet by working numerous jobs, caring for her brother and grandmother and praying that no one finds out that Gladys has Dementia. It was at this point I began questioning how this would all come together, how on earth (or Mars!) these two strands of plot could weave together….but I should never have worried, David Barnett is a master in his craft. Carefully, the plot pulls together to form a wonderfully uplifting and heart warming book. The wonderful cast of characters are superbly drawn, Gladys despite her issues never fails to make a reader laugh. Her situation is lightened sensitively through humour making it feel all the more realistic, so much so that I could see my own grandmother in her. The personalities of all characters really shine through, and for the reader it’s a rare treat to “meet” people you become so invested in. I feel that mention has to go to the descriptiveness of Barnett’s writing, the view from the spaceship was really something else. It was so vivid, so wonderful, and I felt that I could see it. This will definitely be book spoken about in 2017, it’s poignant yet funny and it has a wonderful cast of characters that will warm the heart readers. You can buy a copy of Calling Major Tom via Amazon. David Barnett is an award-winning journalist and author based in West Yorkshire. He was born in Wigan, Lancashire, in 1970 and has worked in regional newspapers since 1989. He is the author of the Gideon Smith alternate history series from Tor Books, beginning in 2013 with Gideon Smith and the Mechanical Girl. David is also the author of Hinterland (2005, reprinted 2008), Angelglass (2007) and The Janus House and Other Two-Faced Tales (2009), all published by Immanion Press, as well as popCULT!, published in 2011 from Pendragon Press. His work has been translated into Czech, Russian and German. He is represented by the literary agent John Jarrold. David is married to Claire, also an award-winning journalist, and they have two children, Charlie and Alice. Daisy Delaney’s life is pancake-flat. A talented baker and passionate lingerie specialist, she has wound up with no one to bake for and a career that hasn’t proved successful. But when she starts a delicious relationship with famous French author-chef, Michel Amiel, everything begins to look a bit more exciting. That is until Michel’s bestselling cookbook is knocked off the top spot by newcomer ‘Lucy Lovecake’. His outdated recipes slide down the charts, while the popularity of Lucy Lovecake’s new dating cookbook is rising like the perfect sponge. The Secret Life of Lucy Lovecake is the perfect book to start your year with, it oozes charm and appeal that has a reader grinning from ear to ear at the wonderful highs and commiserating with the protagonist when it comes to the lows but overall it’s a great book for an escape from the drudgery and rubbish weather of late. Daisy Delaney is a fantastic character, a budding author, talented amateur baker and lingerie sales assistant – she’s a busy lass that’s for sure! She’s just the sort of character that readers will warm to and relate to. Her enthusiasm is infectious, I found that I was excited for her when it came to the launch of her book ‘French Fancy’ under her nom de plume Lucy Lovecake. The chemistry between Daisy and her new love interest Michel Amiel makes for interesting and entertaining reading. Michel is a character that definitely stands out in this book, his behaviour is somewhat prima donna-esque, and so to see the success of Daisy/Lucy makes him all the more grumpy – delightfully entertaining for the audience. The writing itself is so flowing and easy to read that this is a book you can read in one sitting (if the outside world gives you peace and quiet! ), it’s the sort of book you can pick up and become utterly lost in. The plot is fun and well thought out, the characters are a breath of fresh air (even the grumpy Michel! ), but best of all it’s full of optimism and the idea that you can take hold of the reins of life, give them a good pull and decide where you want to go. The author is spot on with her quote “It’s a modern day fairytale – I want to promote the idea that women’s financial independence can dive them emotional freedom. It’s about empowering femininity”. You can buy a copy of The Secret Life of Lucy Lovecake here. Don’t forget to check out the other stops on the blog tour for some brilliant reviews! An uplifting romantic comedy about sisters, friendship and the love of good food. 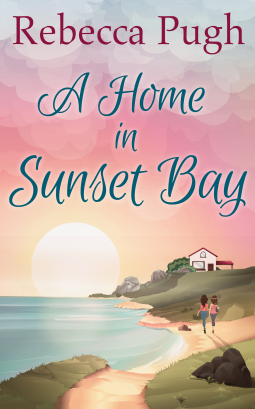 A Home in Sunset Bay is the second book penned by Rebecca Pugh, her first being Return To Bluebell Hill, which has received much praise since publication in June 2015. Set in the small town of Sunset Bay, we encounter Mia Chapman who has taken over running the 50s style diner that had originality belonged to her beloved grandmother. Dolly’s Diner is the stereotypical American diner, great food, bright colours, a jukebox and free refills of coffee, but Pugh’s writing talent gives it something more, a ‘sprinkle of magic dust’ here and there in the description of certain aspects of the place and this reader is desperately wishing it existed purely to have the delight of visiting and experiencing it first hand! Despite being lonely without her grandmother, Mia is enjoying life. She has a lovely home, a successful business, a great team of staff who work well together and the townspeople all seem to love her and the diner. If only she could sort out her love life and things would be perfect. Or perhaps they might if her sister Laurie hadn’t decided to turn up out of the blue and potentially ruin things for Mia. The narration switches from Mia to Laurie to recount Laurie’s tale of just how she ended up in a job she hates, with a man she really doesn’t want anymore and a huge chasm in the relationship with her sister that she doesn’t know how to fix. Suddenly, Laurie isn’t the bad guy in this tale, she’s lost, she’s hurting and she needs her sister more than anything and as the reader, you begin to feel that Mia is unreasonable in her ill-feeling towards Laurie. As the story unfolds, the focus of the book switches from the rebuilding of the relationship of the two sisters, and the development and regrowth of each individually, but also to blossoming friendships and romance. Happiness comes in all shapes and formats, you just have to look for it. The main characters in this book certainly find happiness and others find the love they have longed for, making this a lovely feel good read, it’s warm, it’s enriching and ultimately it leaves the reader with the feeling that all is well in the world. I would recommend this to fans of Marcie Steel and Holly Martin’s books, it’s a lovely read and the sort of book you can happily get lost in for a while. It would also make a great holiday read. You can buy a copy of A Home In Sunset Bay here.